We had an amazing vacation in the land of mountains, lakes and springs the long weekend and how I wish as always , I could freeze the time and live those days over and over again ; else I would have to take these kin of vacations more often. We always stay in down towns where ever we go to capture all the happenings at night ..days we admired the picturesque place , taking scenic drives , boat cruises , and even Six flags :) (scared the hell out of me ) Evenings we roamed around the village , bar-hopped , ate at authentic Italian restaurants , resembling Sicilian villas and enjoyed till midnights the live music on beach. A totally splendid vacation. Many Thanks to all those who have participated in the giveaway - autographed copy of Monica Bhide's Modern Spices . N assigned numbers to all those who left comments here in vazhayila and in FB page and randomly picked a number and The Winner is Lubna Karim. Lubna , please send me your address to ship your win. Ulli Theeyal( theeyal means "fried curry" ) is the first thing I made after the break , as sort of welcoming myself back to my normal routine. Honestly I really have to do something good to get my blogging mojo back. Look at my picture , something is not right..sigh!!! Dissolve tamarind pulp in a cup of water and set aside for 5-10 minutes. Peel , clean and cut Shallots into 2 or 3 big pieces. Heat oil and saute shallots for 4-5 minutes.Cook the shallots with the dissolved tamarind and remaining water ,turmeric , salt to taste and curry leaves for 6-8 minutes or until shallots are tender. Meanwhile,heat a spoon of oil in a pan(optional, you can do this without oil too) , add grated coconut and fry in a medium flame , stirring continuously , till it starts to turn dark brown. Add coriander and chili and continue frying , till the coconut and the spices are dark brown.Switch off the flame. Grind this to a fine paste , by adding little water in the small jar of mixie or coffee grinder. 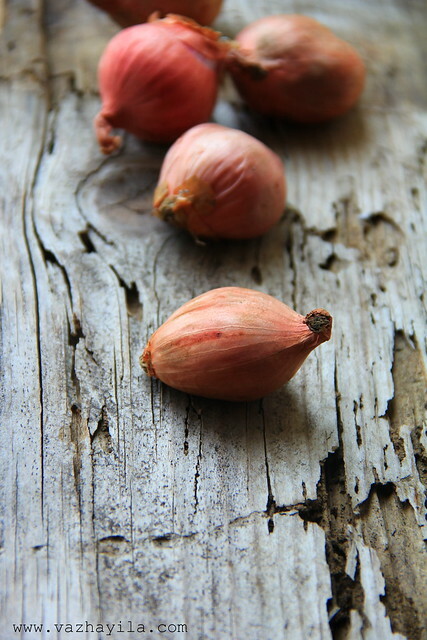 Add this paste to the cooked shallots , combine well and simmer for 2-3 minutes. ( add more hot water , if you want it to be watery).Let heat through but do not let it boil. Remove from heat and set aside. Slurp,fingerlicking ulli theeyal,the picture itself salivating me..delicious!!! Love this any time dear and beautifully captured. There's surely no problem with ur clicks. That makes me mouthwatering Sarah!!! This is yum:) Glad u enjoyed your vacation..
My mum makes this with prawns fried and put in :) Awesome! I have been lurking around your blog fr a bit thought I would comment now!! Wish I can find the smaller shallots like the one we get in India,yummy theeyal.Congrats to Lubna. Curry looks wonderful and delicious !! Congrats to Lubna !! 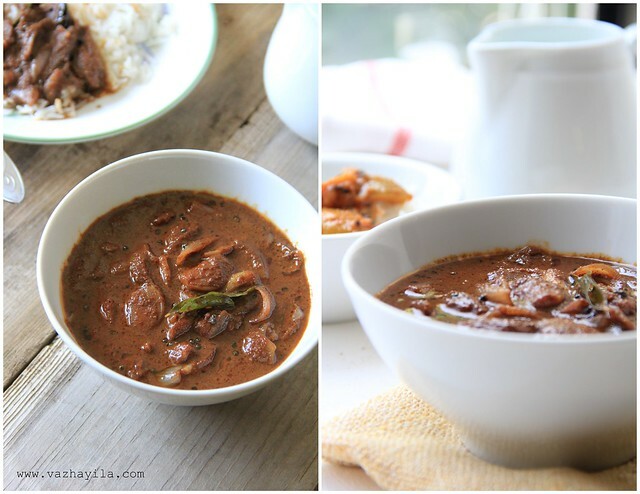 Shallot curry looks awesome and droolworthy. Many Congrats to Lubna upon her win. OMG OMG...Ente fav fav anu ulli theeyal, kothy varunnalo sarahhhh..Eniku control tahrane eeshwara..
With some white rice, just heaven.. such a comforting dish.. awesome pics..
wow..That was a mind blowing yummy theeyal ! !one of my favourite,with plain rice.The colour itself tells us the perfection !! This sounds really delicious and your photos are beautiful!!! Looks mouthwatering and very delicious..Congrats to the winner Lubna Karim..
tempting theyal!! i use little black pepper....urs looks yum yum! !nice click sarah! Gosh! 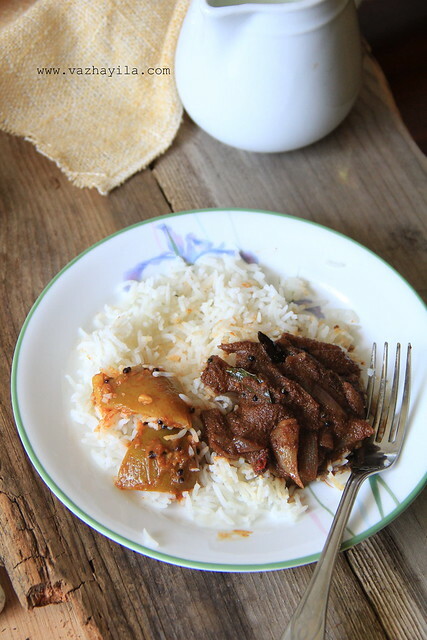 Your post has me drooling for my Mom's Ulli theeyal. I'll be at their place in a week's time. Can't wait. Wow!! it looks amazing.. have to try this out.. Congrats Lubna for winning the prize..
Lovely Sarah. This one is my Husbands fav. Loved your clicks as always. Slurp..Slurp.. Sarah this looks so delicious. Love the colour of the masala. One of my fav theeyal . This is my bro's favourite..
My mom's version : Instead of cutting shallots into 2-3 big pieces,slice thinly and fry it until it makes rattling sound .. (dont over fry -will turn out bitter ). Glad you had a wonderful break Sarah, it's good to see you back! :) And hey don't fret about the photos girl...they're lovely. I've never tasted ulli theeyal...this looks quite authentic. Sarah, that looks SO yummy - have me in a drool pool dear! This is a different kinda dish for me and I am liking the recipe. Your pictures are so beautifully shot! Sarah, I am sure going to try this one. 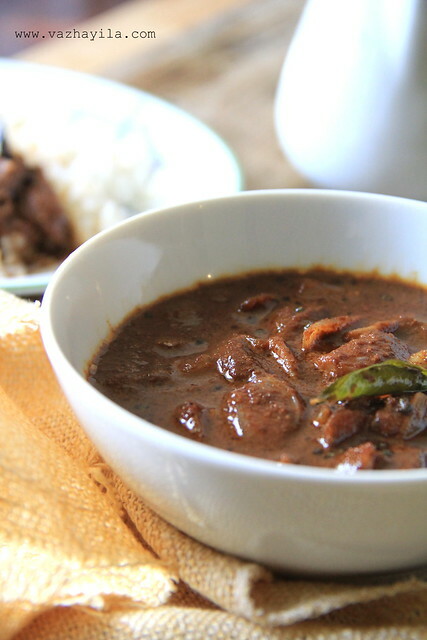 This sounds very easy...and I like tamarind based curries, so this would be perfect for weekdays. This looks perfect!! Great photography too!! Looks so perfect .. love shallots. I made theeyal today with raw plaintain instead of kunjulli , following your recipe and turned out simply delicious. Thanks for sharing.